In early September 2016, Donald Trump announced his plan for a vast expansion of the U.S. military, including 90,000 new soldiers for the Army, nearly 75 new ships for the Navy, and dozens of new fighter aircraft for the Air Force. Although the cost of this increase would be substantial―about $90 billion per year―it would be covered, the GOP presidential candidate said, by cutting wasteful government spending. But where, exactly, is the waste? In fiscal 2015, the federal government engaged in $1.1 trillion of discretionary spending, but relatively small amounts went for things like education (6 percent), veterans’ benefits (6 percent), energy and the environment (4 percent), and transportation (2 percent). 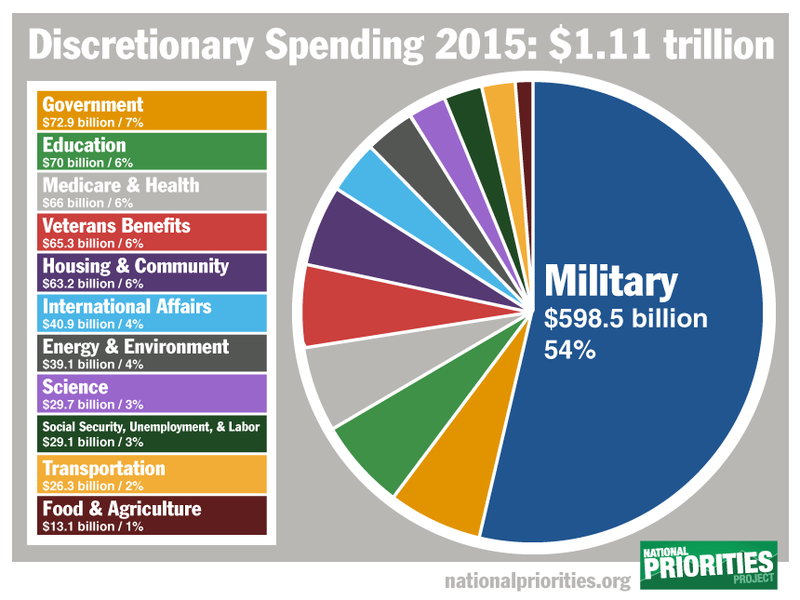 The biggest item, by far, in the U.S. budget was military spending: roughly $600 billion (54 percent). If military spending were increased to $690 billion and other areas were cut to fund this increase, the military would receive roughly 63 percent of the U.S. government’s discretionary spending. If military spending were increased to $690 billion and other areas were cut to fund this increase, the military would receive roughly 63 percent of the U.S. government’s discretionary spending. Well, you might say, maybe it’s worth it. After all, the armed forces defend the United States from enemy attack. But, in fact, the U.S. government already has far more powerful military forces than any other country. China, the world’s #2 military power, spends only about a third of what the United States does on the military. Russia spends about a ninth. There are, of course, occasional terrorist attacks within American borders. But the vast and expensive U.S. military machine―in the form of missiles, fighter planes, battleships, and bombers―is simply not effective against this kind of danger. Furthermore, the U.S. Department of Defense certainly leads the way in wasteful behavior. As William Hartung, the director of the Arms and Security Project of the Center for International Policy, points out, “the military waste machine is running full speed ahead.” There are the helicopter gears worth $500 each purchased by the Army at $8,000 each, the $2.7 billion spent “on an air surveillance balloon that doesn’t work,” and “the accumulation of billions of dollars’ worth of weapons components that will never be used.” Private companies like Halliburton profited handsomely from Pentagon contracts for their projects in Afghanistan, such as “a multimillion-dollar `highway to nowhere,” a $43 million gas station in nowhere, a $25 million ‘state of the art’ headquarters for the U.S. military in Helmand Province . . . that no one ever used, and the payment of actual salaries to countless thousands of no ones aptly labeled ‘ghost soldiers.’ ” Last year, Pro Publica created an interactive graphic revealing $17 billion in wasteful U.S. spending uncovered by the U.S. Special Inspector General for Afghan Reconstruction. The story of the F-35 jet fighter shows how easily U.S. military spending gets out of hand. Back in 2001, when the cost of this aircraft-building program was considered astronomical, the initial estimate was $233 billion. Today, the price tag has more than quadrupled, with estimates ranging from $1.1 trillion to $1.4 trillion, making it the most expensive weapon in human history. The planes reportedly cost $135 million each, and even the pilots’ helmets run $400,000 apiece. Moreover, the planes remain unusable. Although the U.S. Marine Corps and the U.S. Air Force recently declared their versions of the F-35 combat ready, the Pentagon’s top testing official blasted that assertion in a 16-page memo, deriding them as thoroughly unsuitable for combat. The planes, he reported, had “outstanding performance deficiencies.” His assessment was reinforced in mid-September 2016, when the Air Force grounded ten of its first F-35 fighters due to problems with their cooling lines. Even without war, another military expense is likely to create a U.S. budgetary crisis over the course of the next thirty years: $1 trillion for the rebuilding of the U.S. nuclear weapons complex, plus the construction of new nuclear missiles, nuclear submarines, and nuclear-armed aircraft. Aside from the vast cost, an obvious problem with this expenditure is that these weapons will either never be used or, if they are used, will destroy the world. Wikipedia ranks governments’ spending as a percentage of GDP (https://en.wikipedia.org/wiki/Government_spending). Note that you can sort columns by clicking on the headers. The U.S. ranks 46th, between Luxemburg and Argentina. Remove 11% of that spending (about a third of the Military since the above includes non-discretionary spending), so the U.S. would only spend double it’s nearest military competitor (China) and the U.S. ranks 119th, between Fiji and India. …and Clinton and the D’s have led the way (starting with Edmund Muskie) to “balance” the budget…a bizarre exercise that presumes the creator of money (government) is exactly like users of money (households). Austerity, and financial collapse ensued.